Player of the Year Welington Dotel Has Done His Part; Are Majors Watching? What more can Welington Dotel possibly do to prove to scouts that he is worthy of getting an opportunity at a higher level than ever before with one of the 30 major league teams? 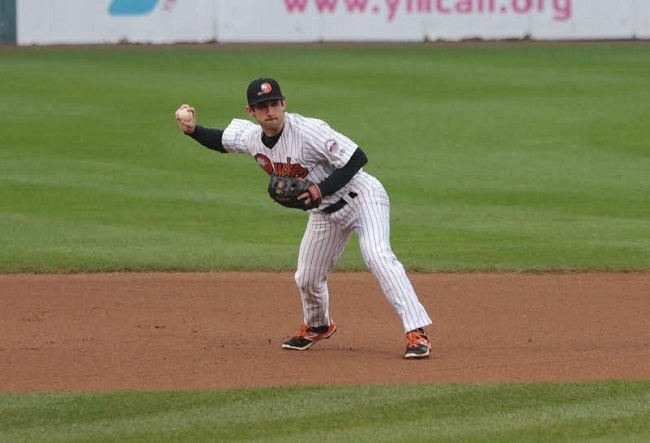 It practically always seems to be pitchers who get the greatest look, but this consensus standout among the everyday players proved his ability this season on his way to being selected as one of the three outfielders on the Atlantic League's postseason all-star team, making the all-defensive outfield and capping it off with Player of the Year honors. Okay, the Bridgeport speedster just turned 30 earlier this month, but that is hardly ancient as the game is played today. The Dominican native has not spent time in any major league organization since he was 24, and he has only played 50 games in a season once for American or National League decision makers. It cannot be for lack of effort because two opposing Atlantic League managers offered to this typist during the season Dotel "plays hard every single game". And, it cannot be for lack of statistical production because the 6-foot-1, right-handed batsman won the league batting title at a lusty .340 in a year when there were few .300 hitters. The only reasonable threat to the hitting crown, former major leaguer Sean Burroughs, had nearly 200 fewer at-bats. Dotel's 180 hits were 26 more than anyone else during the 140-game season, his 45 stolen bases were 11 more than anyone else and his 13 triples were four more than any other player. In addition to Welington Dotel, Long Island shortstop Dan Lyons and York first baseman Andres Perez were the only two Atlantic League players named to both the end-of-season all-star team and the all-defensive team. While postseason all-star teams are easy to challenge because of the subjectivity and concentration on young players, Baseball America magazine listed three Atlantic League pitchers and three position players among "players to watch" for the future. They are RHPs Matt Gorgen of Camden and Marcus Walden of Lancaster, LHP Buddy Boshers of Somerset, 2B-SS Mikey Reynolds of York and OFs Delta Cleary of Long Island and Zach Collier of Lancaster. It is a tribute to Manager of the Year Brett Jodie and his wife that before they slipped away for some needed family rest after he led Somerset to the league championship they spent some time scouting their home area around flood-ravaged Columbia, SC to see if they could find ways of helping those less fortunate. The Jodie home escaped any flooding. Tim Stauffer, who jumped from Sugar Land to the New York Mets late in the season, has been designated for assignment by the National League team. The 33-year-old, who has a 33-34 major league record, worked 5.2 innings in five games for the Mets during the regular-season stretch drive, giving up eight hits and five runs while also striking out eight batters.